"qwertee" - Blog @ That Awesome Shirt! Click here to see our top picks or shop directly at Qwertee. Buy any 3 tees or prints and get the cheapest one FOR FREE! Buy 6 and GET 2 FREE! Stock your cart with our favourites or check out qwertee.com. 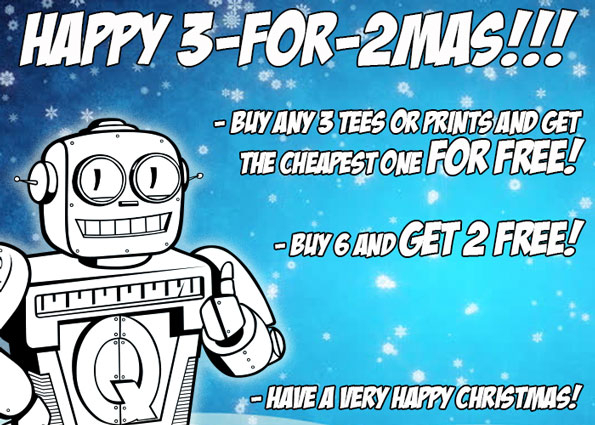 Qwertee: Ho Ho Half Price Tees! IMPORTANT UPDATE!! Christmas Season is well and truly in FULL SWING, so we've got an EXTRA SPECIAL surprise just for YOU! For 48 Hours, we're giving you a WHOPPING 50% OFF on EVERY DESIGN in our Tee Shop!! This means you GET TO CHOOSE your very own designs at the absolutely INCREDIBLE price of £6/€8/$8!! Stock will definitely SELL FAST (especially at this LOW price), so make sure to get your FAVORITE TEES before they're GONE!! Ends 17th of December, 2017. GET A FREE TEE RIGHT NOW!!! 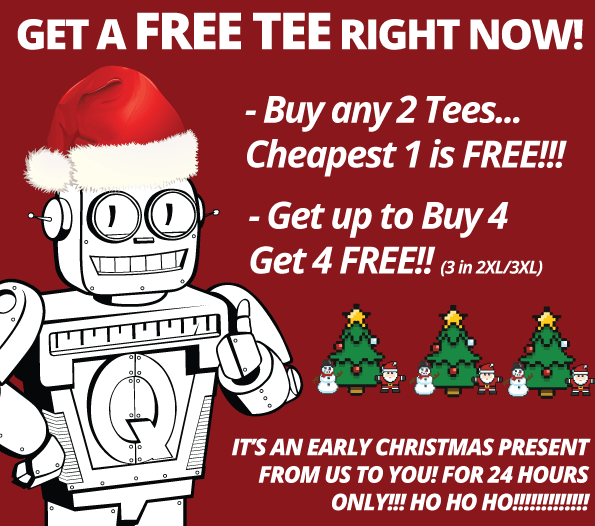 An Early Christmas Present FOR 24 HOURS ONLY!!! Ends 8th of December, 2017. CYBER MONDAY is ALMOST HERE!!! And to celebrate, we're launching EVEN MORE special offers...to add to the AMAZING Black Friday bargains that we already have, we've now reduced designs in our Tee Shop EVEN FURTHER so that there's up to 88% OFF! That means Awesome Tees with prices as low as €2/£2/$2, 30+ new designs for just £4/€5/$6 added right now with MANY MORE price drops on an EVEN Bigger selection of designs than on Black Friday. 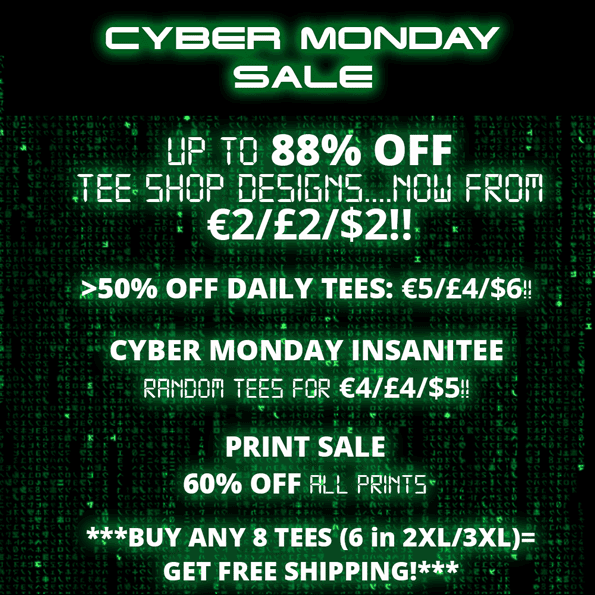 On top of this, Daily Tees will be the PHENOMENALLY reduced price of €5/£4/$6! We're also extending our InsaniTEE sale for a FINAL 24HRS, where you can get AWESOME RANDOM TEES for our GREATEST EVER Price of €4/£4/$5. And don't forget, our Print Shop is also 60% OFF for EVERY SINGLE PRINT, which equals a price of €4/£4/$5. Finally, there's also FREE SHIPPING when you Buy ANY 8 TEES. This is our GREATEST EVER sale, and STOCK IS SELLING OUT FAST.......Don't Miss Out!!!! Plus 60% off all prints!